Click on Charmouth Home to return back. 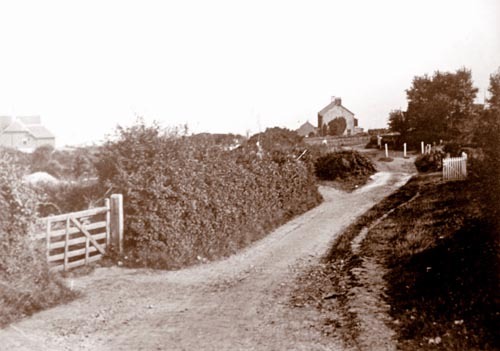 Higher Sea Lane c.1910 with the gate to the Red Bungalow on the right. 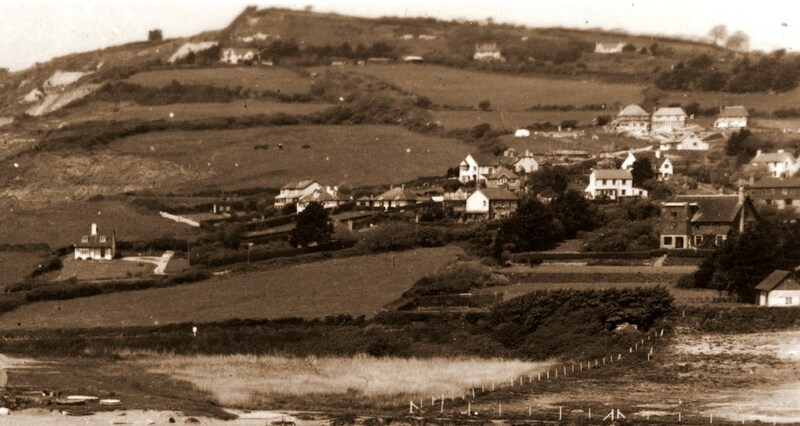 Higher Sea Lane c.1910 with Bay View in the distance on the right.. 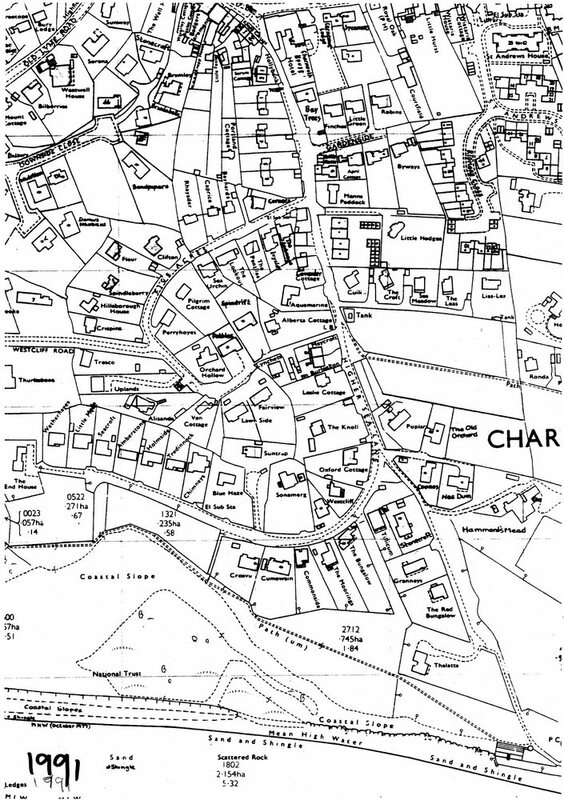 I originally thought I would research the Lane I live in, as I had previously looked into the history of the Lords of the Manor of Charmouth who at one time had owned the field my house stood on and much of the surrounding area. But what of the rest of the land up to the Street, with so many houses being built there in the last century along Higher Sea Lane, Westcliff Road, Five Acres, Double Common and Downside Close. I am sure the time spent would be worthwhile as I am not aware of anyone at present, apart from the Historian- Reginald Pavey, putting pen to paper on the subject. I have combed masses of deeds, documents, tax lists, census's, directories, etc in my quest to see who owned what. 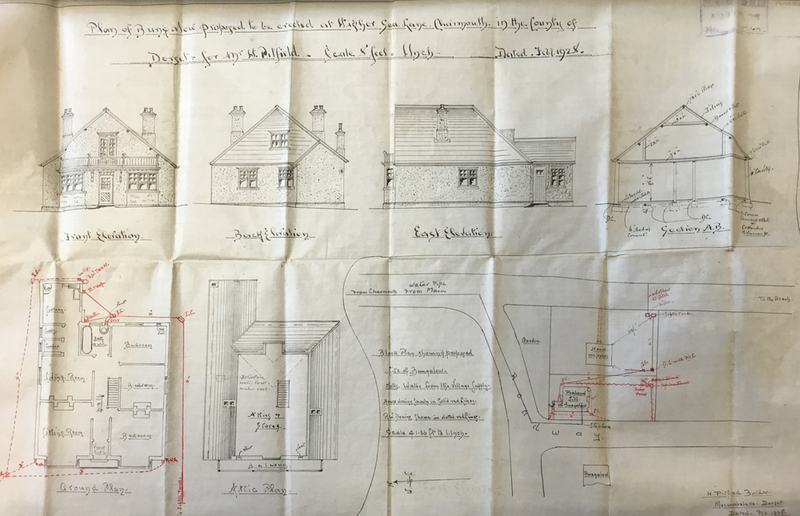 It would have been so much easier if I had been able to see the original deeds, and would be grateful if anyone who has these would contact me so that we can add to our knowledge of the area. The recent history from 1900 onwards is fairly easy as all one has to do is go to the Dorset Record Office, who have annual listings for the village in the form of the Electoral Rolls. As most houses have been built within this time span I have avoided doing detailed listings of every property as that would soon fill the Shoreline for many issues into the future and really only be interested to those who live in the houses today. Instead I am going to look at the subject broadly and go back as far as I can and give a short insight into the more historic properties. 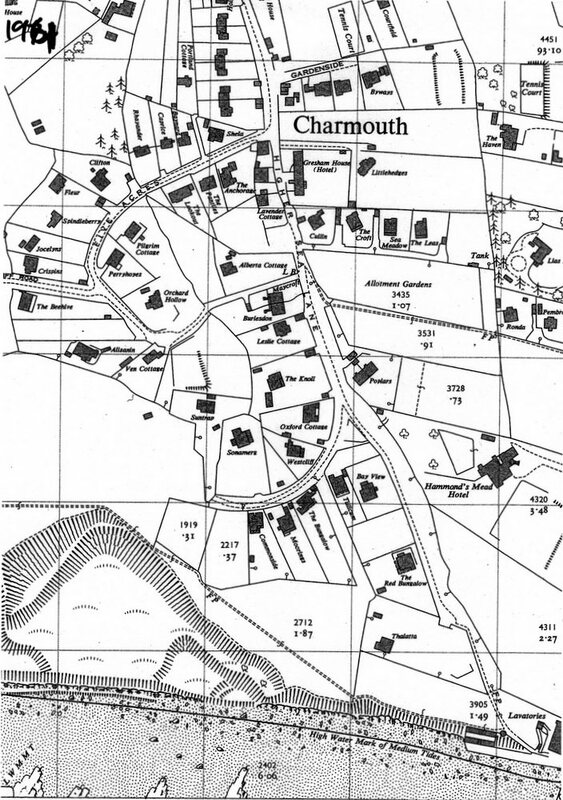 The early history of Charmouth is fairly straightforward as it was a Manor, originally owned in 1086, the year of the Domesday by Earl Mortain, brother of William the Conqueror with many others in England. By 1170 Richard del Estre had given the Manor of Charmouth to Forde Abbey, who were to own the village for the next 4 centuries. In 1297 they created a Borough with a number of adjoining plots, roughly half acre in size stretching back on both sides of the Street. To the North the wall has survived to this day and the boundary of an earth bank on the south side is still to be seen in places. There were a number of houses strung out along the Street on both sides and many still date back to that era. 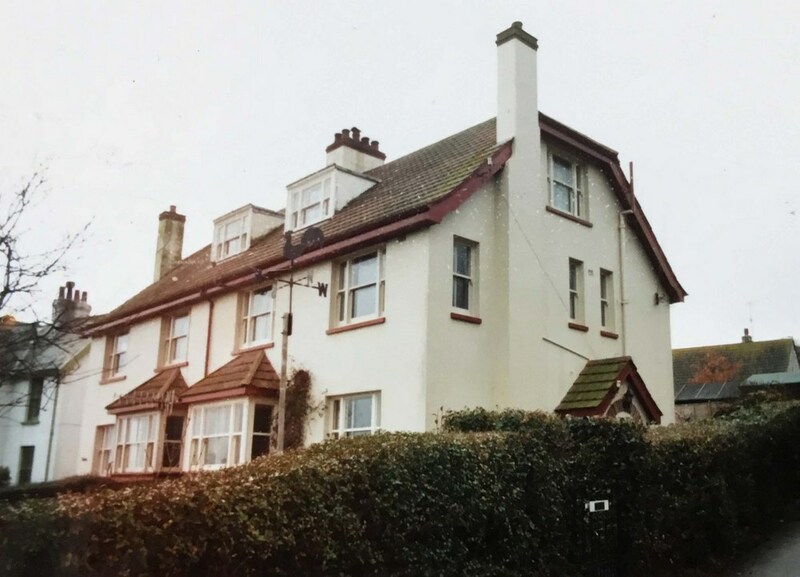 Of special note is �Charmouth House� on the corner of Higher Sea Lane, which was known as the Fountain Inn and would have been a Hostelry serving travellers on the road linking Dorchester and Exeter. 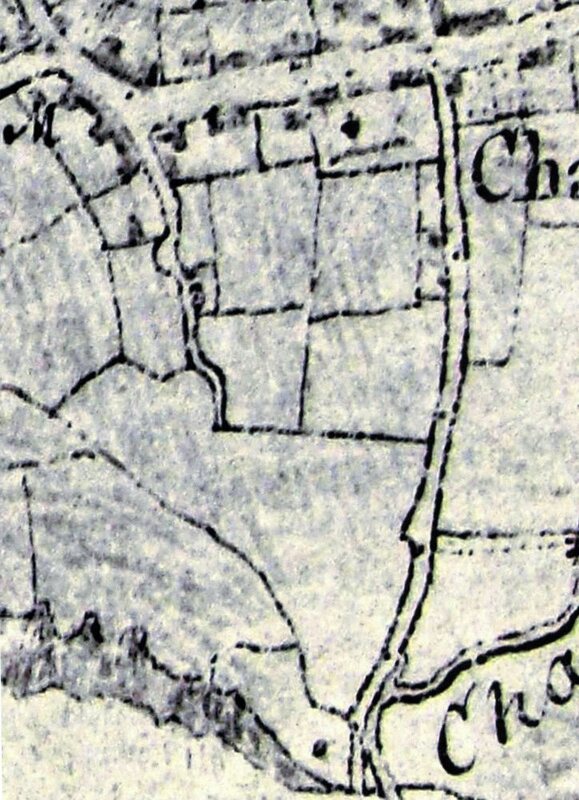 Another vestige of the middle ages is in the open strip field system of farming which stretched to the east of Higher Sea Lane and was preserved with its names of Single and Double Common. In 1539 Forde Abbey was surrendered to King Henry VIII and in 1564 Robert and William Caldwell purchased the village and Newlands from Queen Elizabeth I for £25-5-1d. They in turn sold it on to Sir William Petre of Ingatestone in Essex,in the same year, who had been Secretary of State for four monarchs. He died in 1572 and left his estates to his son Sir John Petre of Writtle. Three years later in the pursuit of purchasing the adjoining West Thorndon Hall Estate with its 12,000 acres he started selling off some of his other properties. 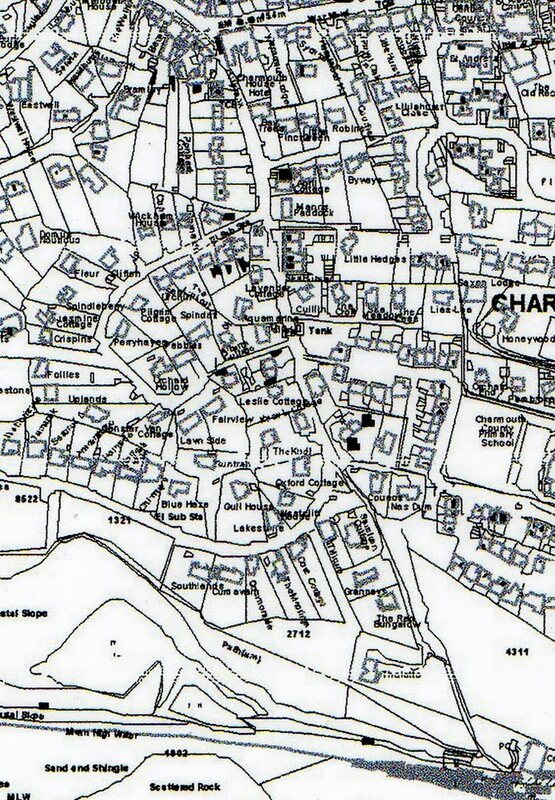 These included properties in Charmouth on 2000-year leases for small rents. Amongst these were the Limes, the Elms, Rose & Crown and Charmouth House. William Pole of Shute, Near Axminster, purchased the remainder of the Manor. This family was very wealthy and owned many other estates in the area and one can see still their castle and home now run by the National Trust. 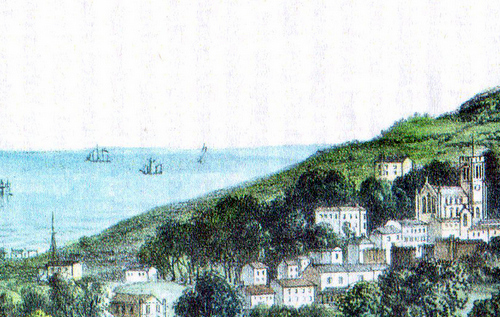 The Grandson of William Pole sold the Manor of Charmouth to William Ellesdon from Lyme Regis in 1648. This family and a branch called Henvill owned much of the village until it was put up for sale in 1783 at auction and bought by Lieutenant James Warden whose claim to fame was being killed in a duel at Hunters Cross by a neighbour who he had fallen out with. On his death the Manor went to his wife and then daughter Ann Liddon, who was always short of money and it was mortgaged for all the time she owned it. It was her son Mathew who sold it in 1853 to George Hender Frean, whose son was the founder of Peak Frean biscuits. He bought the estate to develop the beach and with his nephew, Michael Morcom built the steam operated Cement Works, now the Heritage Centre. But it did not succeed and he in turn sold it to Sir John Hawkshaw, the famous railway engineer, who offered him a good profit on his purchase. 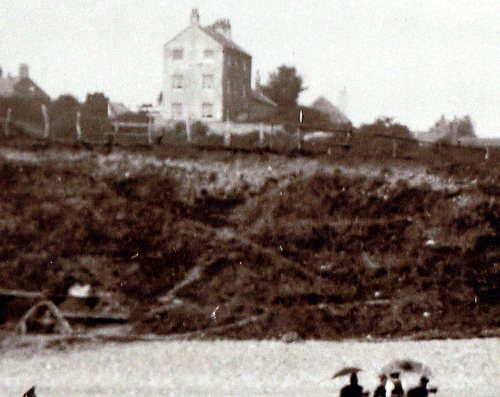 In 1864 Hawkshaw attempted to develop a railway line through the village with its own station from Lyme Regis to connect with the recently opened branch in Bridport, but when the Act went to Parliament it was opposed by Great Western Railway and did not succeed. 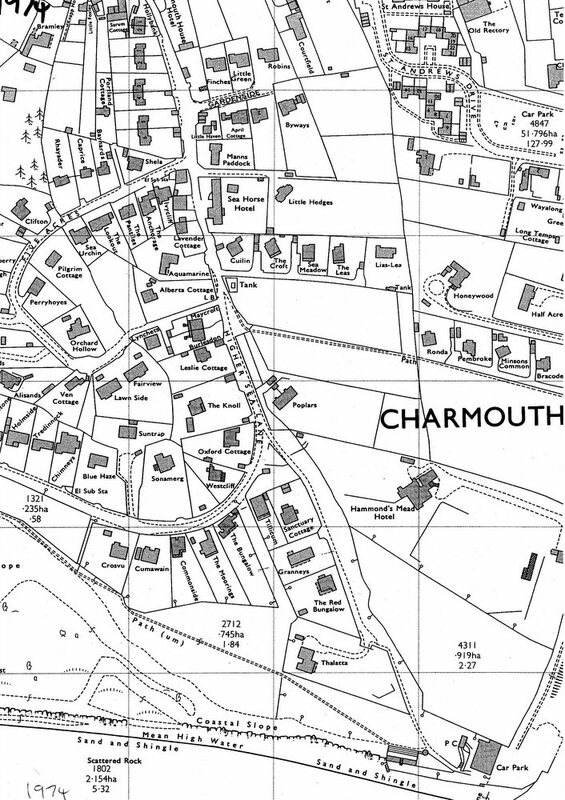 A number of attempts had been made to link Charmouth with Bridport. In 1846 Isambard Kingdom Brunel had plans drawn up to connect his main line with the village, but it came to nothing. The most astonishing proposal was in 1874 by the Lyme Regis Railway who wanted to run a line along the coast from Lyme , then north of the Cement Works, where Thalatta is today, through the village and on to Bridport. 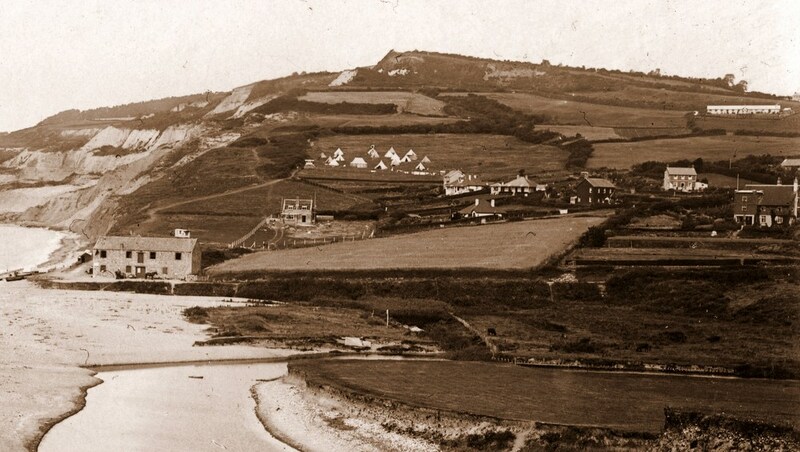 With his inability to proceed with his line Hawkshaw placed all he had bought which included a big chunk of Lyme Regis up for auction in 1867, but it did not all sell and his son was to still own Lilly Farm up until the First World War. The map that went with the auction shows that Lot 31 which included the Cement Works with 64 acres, did not make its reserve of £4000. Lot 30, which was known as The Drang, went for £210 to James Cadbury and George Darby bought Lot 29 - Double Common for £185. Three years later John James Coulton, a solicitor in Kings Lynn, bought Lot 30 for £3000 and for the next 30 years was to be the Lord of the Manor, even though he never lived here. 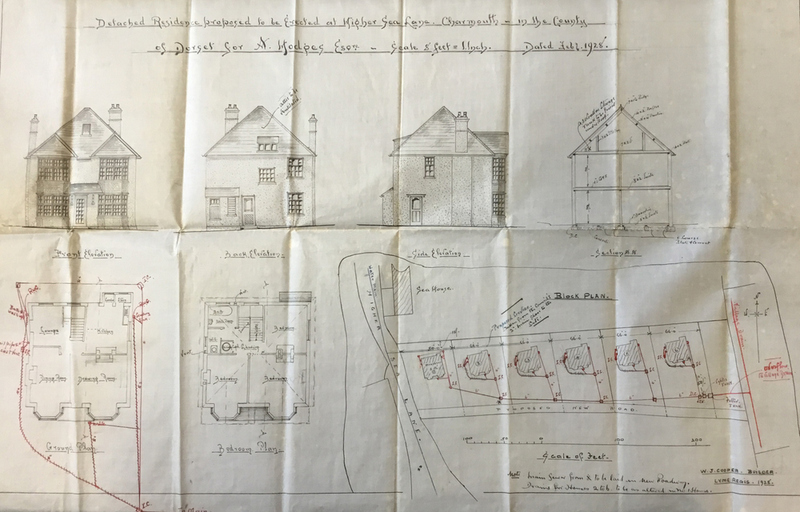 By 1898 he had purchased the adjoining plot of the Drang from John Hodges and decides to divide it and the adjoining fields into 55 small plots, which he offered for sale. There is an interesting map showing in detail where these were to be and how Higher Sea Lane was to get a new road as, previously it only led to Double Common as the rest was fields known as Sea Lands. But it backfired on him and only a few were sold. Some of those built are the earliest houses in the Lane and include Roberts Cottage, Alberta, Lavender Cottage and Leslie Cottage. Again in 1904 he attempted to sell the balance of the plots, but no one turned up. Before he died in 1908 he was negotiating to sell the remainder of his estate to Alfred Pass of Wootton Fitzpaine. But both died in the same year and it was their sons who were to complete the sale and in that year Douglas was to buy the manor for £1400. He in due course sold fields off piecemeal. 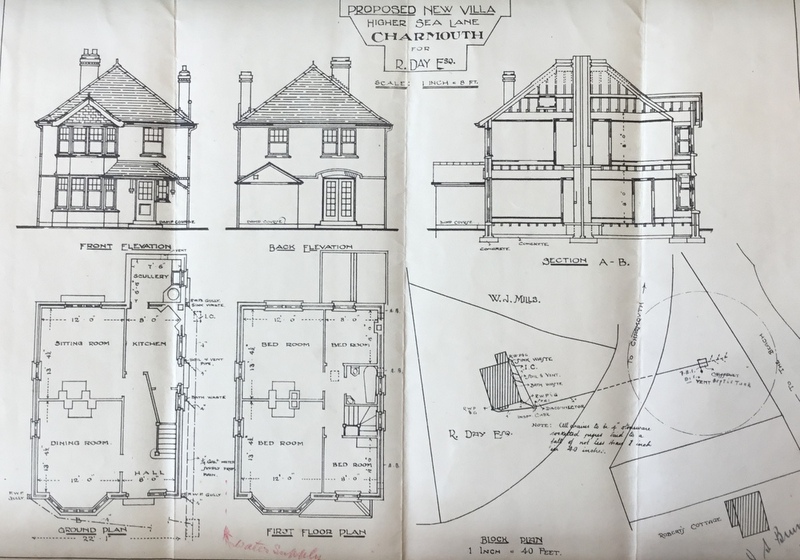 My own house, Thalatta was bought for £130 with an acre of land in 1922 by Miss Grace Icombe from Ealing who was to have a house built on it shortly afterwards. 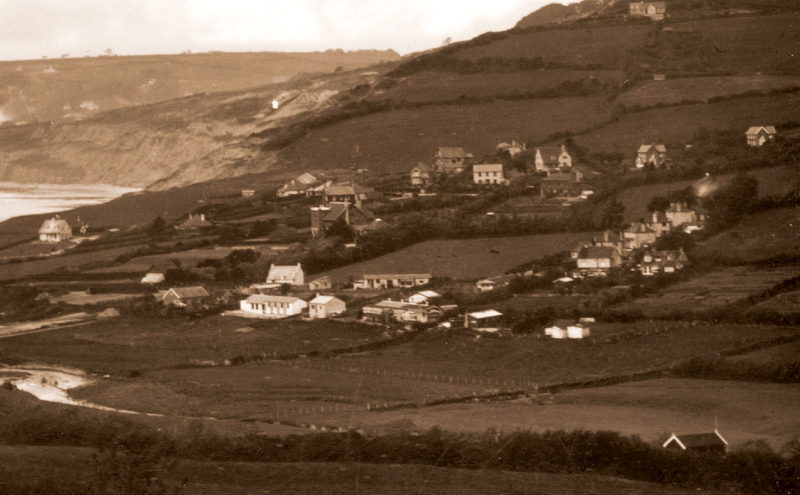 In 1938 Douglas sold the Cement Works and most of the foreshore to the Charmouth parish Council for £2974. That very briefly is the history of the Manor lands and how over the centuries they were was sold off. All that messuage, cottage or tenement lying between a cottage then in the tenure of William Rockett on the west side of another cottage then in the tenure of William Best on the East side and the queens highway on the north side. It consists of Barnes,Stables, edifices, lands, meadows, pastures, common ways, paths, woods, under woods, easements. There were 40 acres of fields including the Fountain Inn and in time these were sold by Edward`s Grandson also Edward to Edward Lush of Chideock. He in turn sold them To Robert Burridge. Later in 1704 there is another reference to the farm as follows: �The property consisted of Curtilages, gardens, orchards, yards, barnes, stables, outhouses, easements and Appurtenances also 2 little closes of Meades lying and adjoining the messuage of about 3 1/2 acres. and all that field and close called Holemead about 6 acres. Tenants Edward Roberts, William Rednor�. By 1753 Francis Folaquier and Elizabeth his wife, who was Robert Burridge`s granddaughter, put the estate up for sale . They divided it into three separate lots. It would seem that Edward Burrow was to have Harners Hill and 3 closes at Langmoor and Benjamin Bradford the farm known as Lushes after a previous owner . Burrow sold his part on to Walter Oke of Pinney, near Axmouth in the same year. 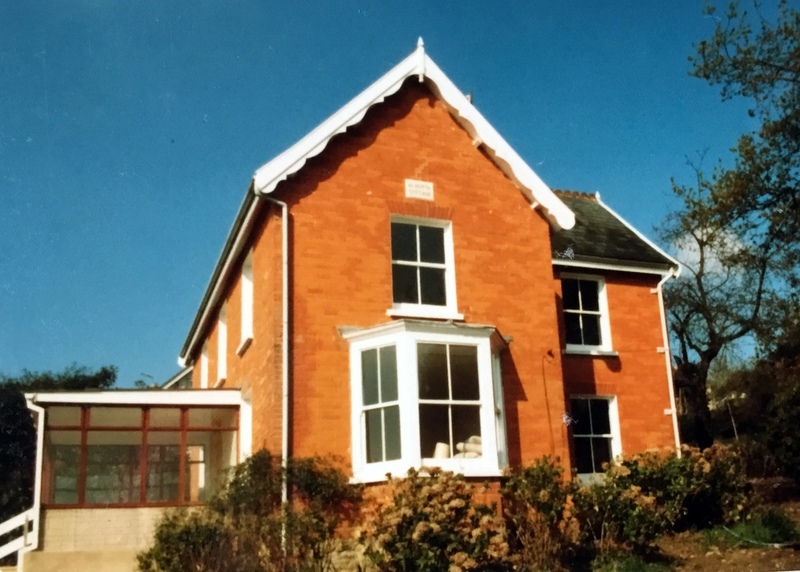 The third part � �The Fountain Inn� (Charmouth House) with 4 acres was purchased by John Goring. The 1754 Poor rates for the village detail the landowners of the time and all of these are clearly shown with their respective properties. These fields were to make up most of the balance of the lands around Higher Sea lane that were not owned by the Lord of the Manor at that time, who was Benedicta Henvill. She was a descendant of William Ellesden and was married to the Reverend Joseph Durston, living in a vicarage in Compton Greenfield in Gloucester. The many fields that lay between the coast and �The Street� focussed on several houses that had been built along it from the times when Forde Abbey owned it. The fields mentioned and their acreage are virtually unchanged to those shown later on the 1841 Tithe Map. Many of the names such as Hammetts Mead (Hammond's Mead), Double Common, Great Foxley, and The Drang are still recognisable today. A study of the Street is worthwhile as it explains the field pattern behind it. It would seem that where �Melbourne House� is today was part of a field known as Guppys, which belonged to the Manor. In the 1841 Census Ann Liddon (aged 70), who owned the Manor was living there with her two daughters Lucy and Sophia. The next plot to the east, which is now known as �The Well Head�, but latterly Bruton House, has a set of deeds going back to 1683 when Mrs Balston sold it with an acre of land to George Mantle. The series of documents goes as far as 1800 and then poor rates and censuses show that it was later owned by a John Bull who left it to his daughter Elizabeth Shiles who is shown as owner on the 1841 Tithe Map. 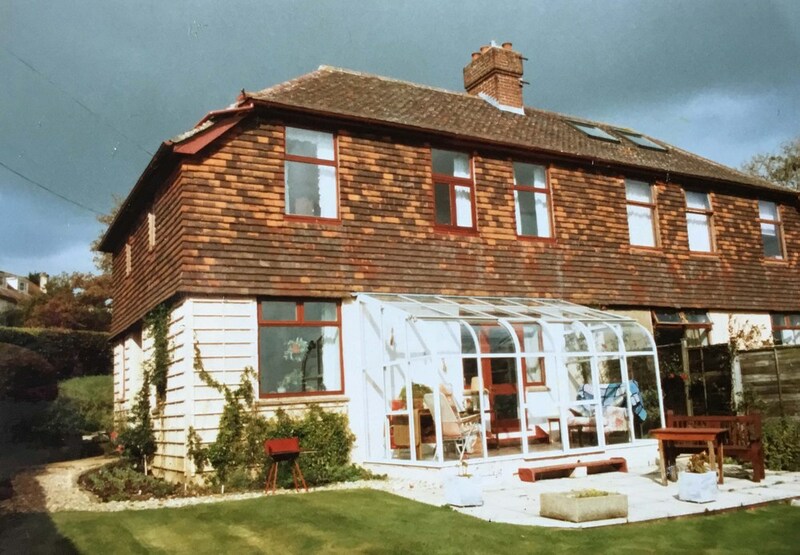 The next property, which is now subdivided into �Foxley Cottage� and �Badgers�, was the original farmhouse that is referred to in the 1708 document and no doubt goes back much further. Benjamin Bradford, a wealthy Clothier from Wootton Fitzpaine, bought it in 1754 and lived there whilst John Bowdridge farmed the 22 acres of land that made up the farm, which was then known as Lushes after the previous owner. 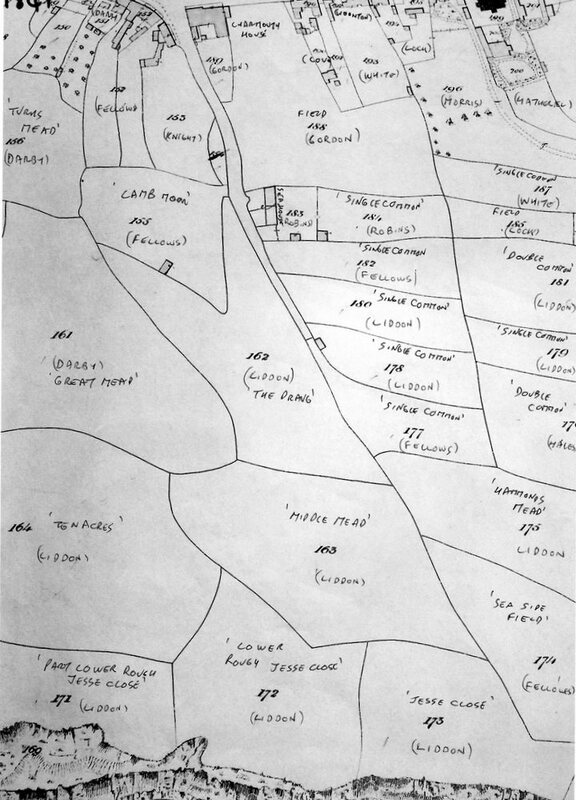 In 1783 a map was drawn up for the village, but only the record book has survived. But it does show houses and fields in the village with their owners and acreage. When he died in 1792 he left property in Axminster, Whitchurch and Monkton Wyld to his many relations and over £8000 in capital, shares and bonds. He appointed William Combe, the villages Rector as one of the trustees and for the next 40 years they distributed the annual income to his heirs and friends. Their original account book can still be seen in the Dorset record Office and gives a detailed snapshot of the village at the time. Every year they would pay out for a party at the nearby Fountain Inn when the tenants paid their rents. In 1841 George Darby, a wealthy Merchant living in Bridport who had married the niece of Benjamin was the major beneficiary. 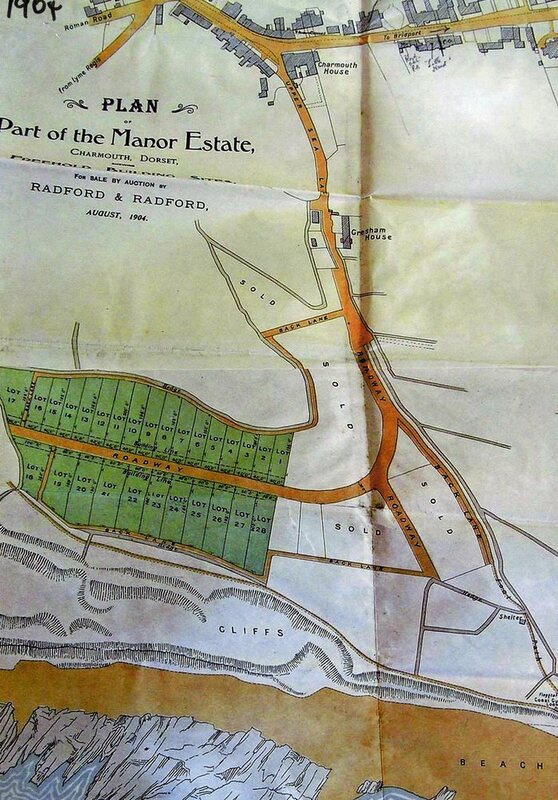 The farm at that time was rented by Joseph Cozens.But the original Will made it difficult to sell the estate and a map in 1867 shows it being partly owned by a Miss Balson who was one of the original heirs. In time it would be sold to Reuben Durrant who is shown as farming the land in 1881. He lived in Bruton House rather than the old Farmhouse. Old photos of the rear show a number of farm buildings including a piggery. 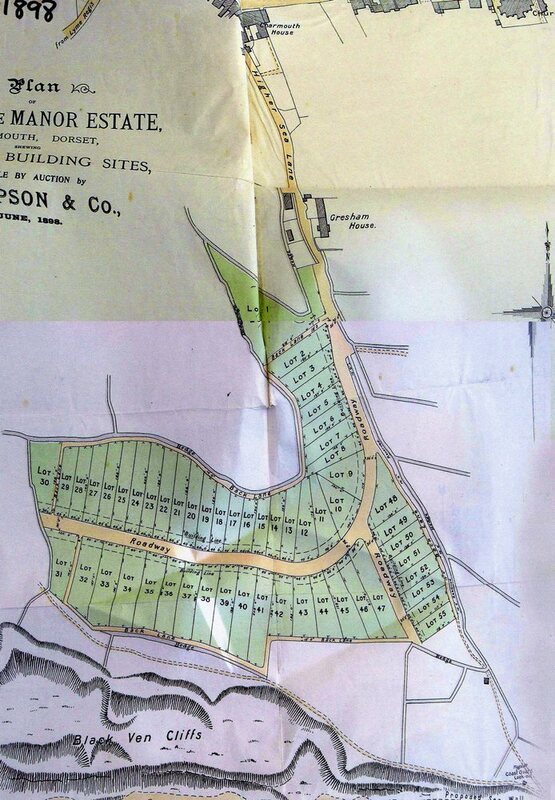 In 1931 the farm and the adjacent fields were bought by Edward Washer, a speculative builder . He pulled down the barn by the entrance and built *Waverley � . The farm buildings in the yard were converted into a small bungalow without completely destroying the cowsheds. 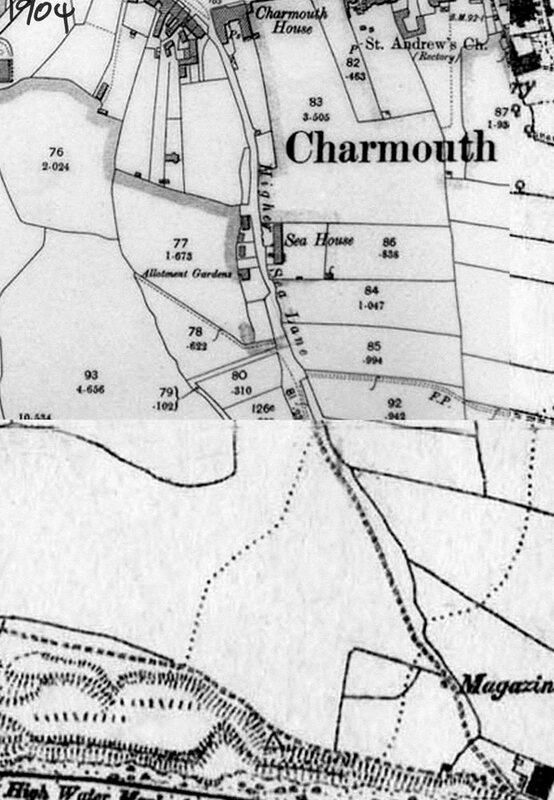 Most of the fields that were not owned by the Manor were included in Foxley Farm, but there are two exceptions those that went with the building now known as �Claremont� and those with �Charmouth House� that I hope to deal with. I have had to work back from the 1841 Tithe Map to track down their ownership. 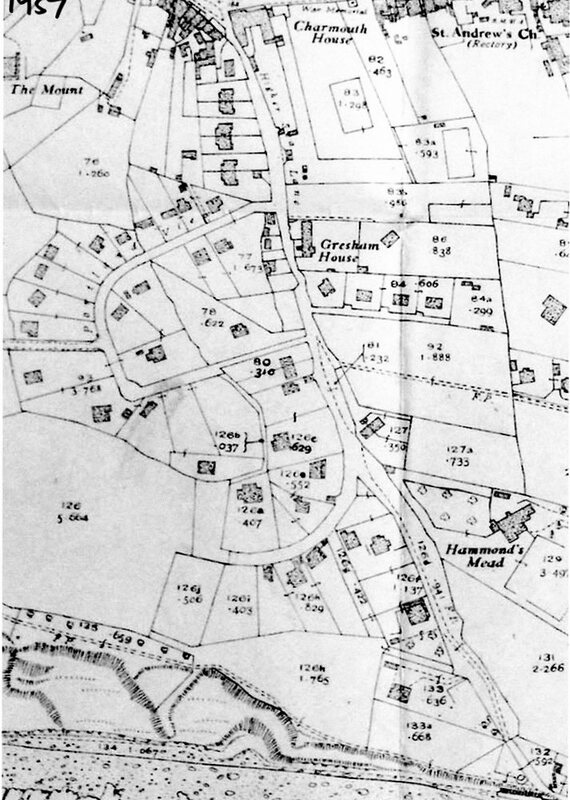 For those researching the history of their buildings in the village we are fortunate in that there are detailed Census's that run from 1911 to 1841 and this is the same year as the Tithe Map which helps locate where people lived. Then there are Poor Rates and land Tax Lists which run from 1780 until 1832. Only one list for 1754 has survived prior to this, which is a shame. 103 Mrs Mary Aust, House & Orchard opposite the Fountain Inn Garden (£2-10-0d) 0a 2p 26r. Looking back to the 1754 Poor Rates List showed that Mr William Grey owned the property in that year. The Will for Mary Aust who died in 1821 revealed that she lived in Mile End in Essex and she was to leave her property to her nephew Harry Smith. Benjamin Fellows was a relation who in his Will of 1842 leaves it to a Mrs Smith. It would seem that as was so often the case in this village many of the owners were absentee landlords collecting their rents from afar. 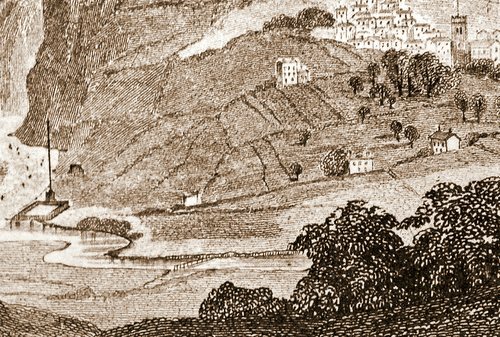 The last major land holding went with Charmouth House in 1754 when it was bought by John Goring from Francis Folaquier and Elizabeth his wife. There was a meadow of about 4 acres with the Inn and on the opposite side of the lane was a smaller field with a house on it now known as Knapp Cottages. There was very little development on these fields apart from a strip called Thomas's plot that was sold and a cottage was built on it. In 1783 it is shown in the map reference book as being owned by William Lock. He was a labourer who was to sell his house to his employer, Uriah Dare of Wootton Fitzpaine for £42 in 1796. This was to be the first house to be built in the lane that was known then as Rockets lane. The Rocketts appear in the parish records in the 17 th century and there is reference to a William Rocket owning a house next to Foxley Farm House in an old deed as well as on the 1641 protestant returns list . Uriah Dare was to build an impressive house with a number of outbuildings on the site that he sold to the Rev. John Lucy for £1000 in 1801. It was then known as �Sea House� when he sold it to John Robins for the same figure. By 1883 it had been bought by the husband of Elizabeth Holly, whose father William, owned the adjacent �Charmouth House�. Walter Salisbury changed the name to �Gresham House� after where he used to work as a Warehouse apprentice in London. For many years they ran a boarding house and later it was called the "Sea Horse Hotel", which was demolished in 1990 and replaced with a block of apartments bearing the same name. 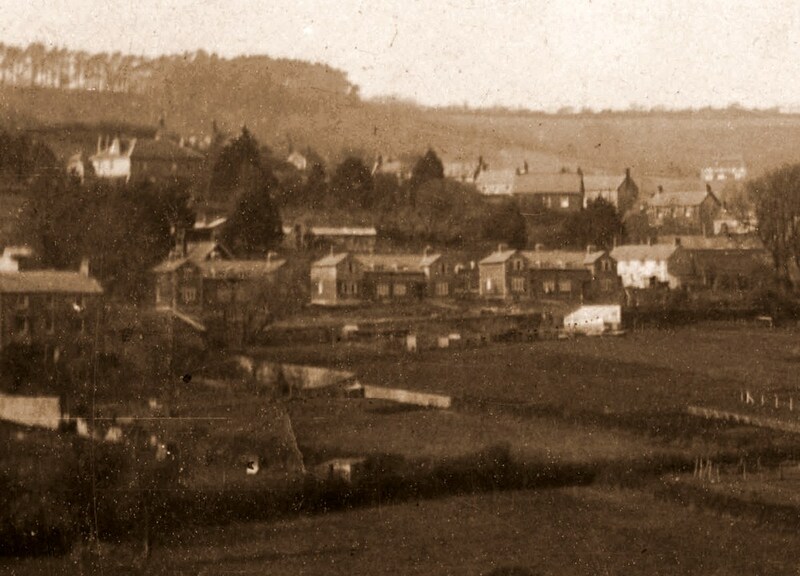 The original house had three storeys and with no properties around it stood out in early photographic views of the village. A narrow drive lead up to it and continued a short distance to Double Common where there was a gate leading into the 'Higher Sea Fields' - a path through to the beach . Opposite Gresham House was another gate that led into the �Allotment Field� - known formerly as "Lamb Moor", beyond and westward was "Stony Close" or "Rough Close' ; south of which was "Great Mead" later called "Five Acres". 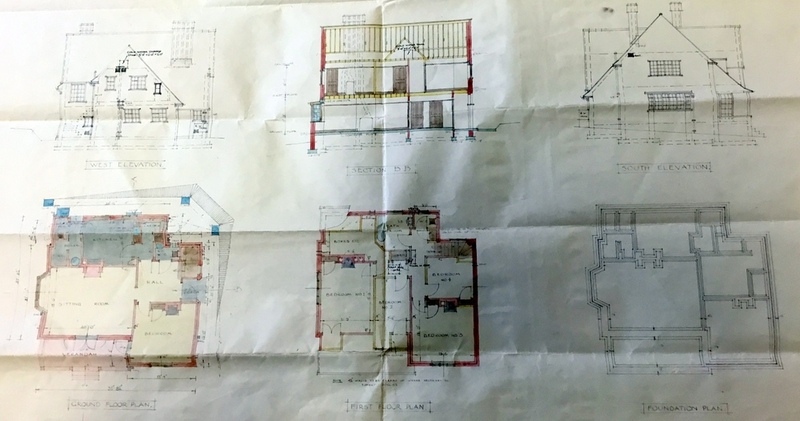 The next house to be built was "Soldier's Cottage" by Alfred Bowditch in 1898 after paying £7 10s for the plot, which is now called "Lavender Cottage". Shortly afterwards Isaac Hunter who had paid £5 to James Coulton, built a shed to house his fossils, an Ichthyosaurus being the chief specimen. An inverted boat formed the roof. Eventually he built a cottage on the site in which he lived for many years. It is now known as "Victoria Cottage". About the same time a cottage was built on lots 49, 50, 51 on field then known as Middle Mead � opposite 'Hammonds Mead" and was known as "Robert's Cottage", after the owner. It was later bought by Harry Smith, a fisherman who built "Bay View", using beach stones and part of a wreck washed up on the east beach. The stones weathered badly and the south wall of the house was tarred to keep the damp out. Later the wall was covered with sheets of asbestos. The front door should have faced west, leading to the right of way to the beach. Instead he made the front door to open on to the path facing east, which created a strip of ground at the rear leading nowhere. It was sold by Harry Smith's son Percy and is now called "Sanctuary". Cottage - Helen Brenton. Widow 88, living on own means. Leslie Cottage- Mark Mills 67. Retired Commercial Traveller. Alberta - William Symes 56, Widower police pensioner. 1810 Colonel Mudges Map showing Higher Sea Lane terminating at Single Common. 1841 Tithe Map with description of fields and owners in brackets. 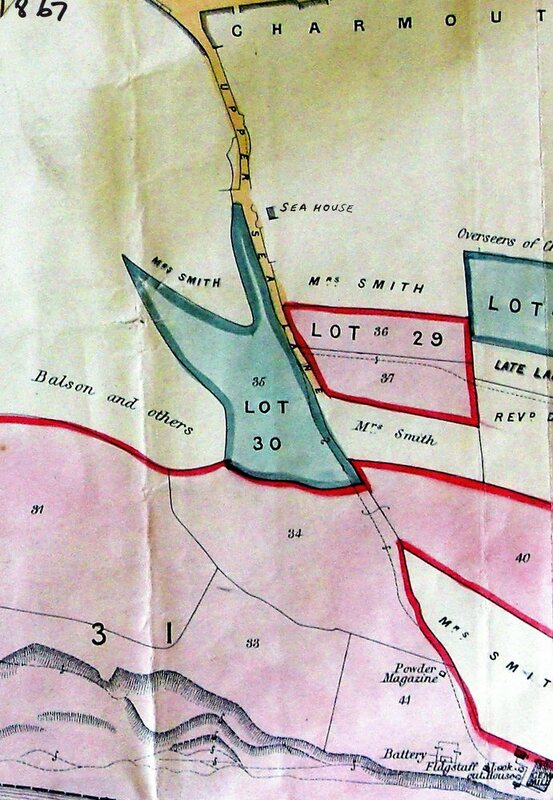 1867 Map used for Auction of lands owned by Sir John Hawkshaw showing lots 29,30,31 bordering on to Higher Sea Lane. 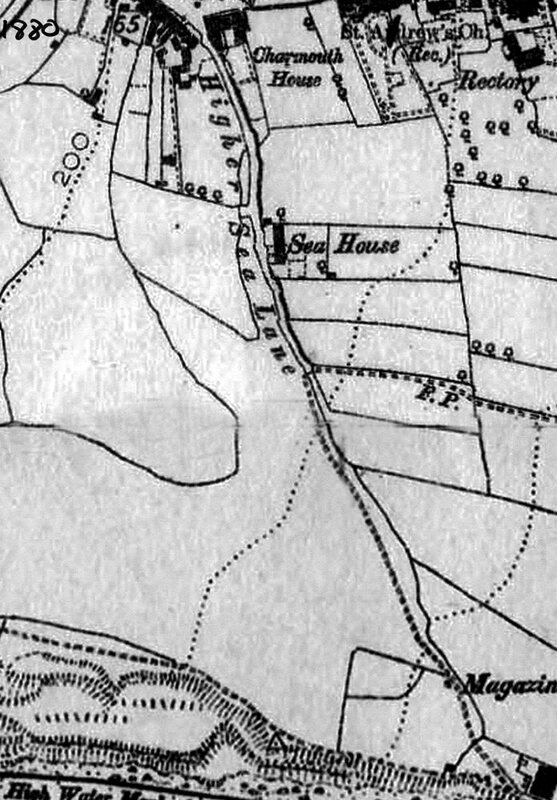 1880 Ordnance Survey Map showing just Sea Horse House standing in Higher Sea Lane. 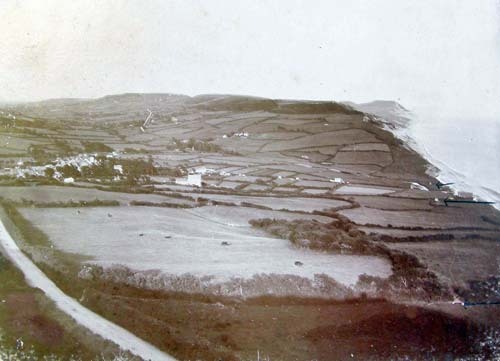 1898 Auction of plots along Higher Sea Lane by John Coulton, owner of the Manor of Charmouth. 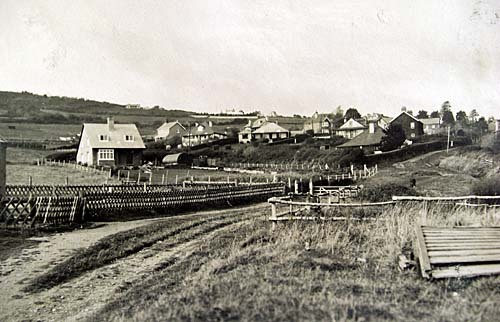 1904 Auction of plots along Higher Sea Lane, which were not sold previously in the 1898 Auction. 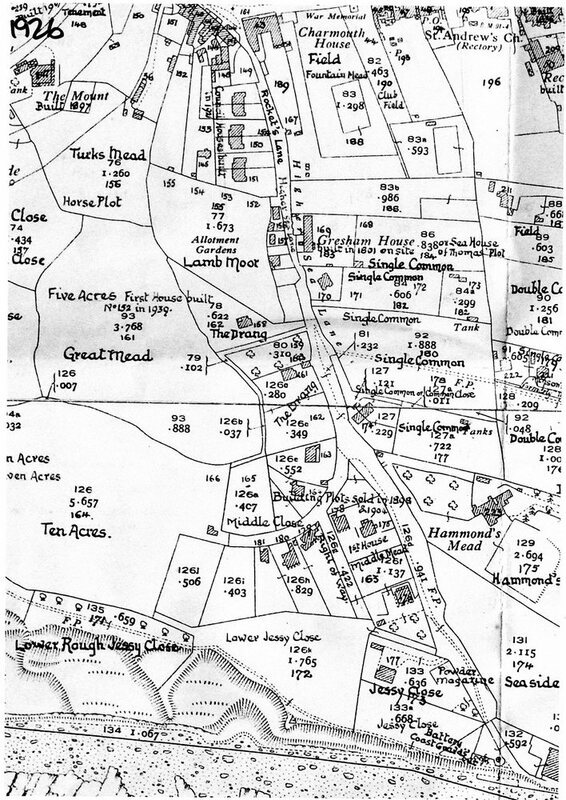 1926 Ordnance Survey Map with historic notes added by Reg. Pavey.c1960. listed below are the house numbers shown. 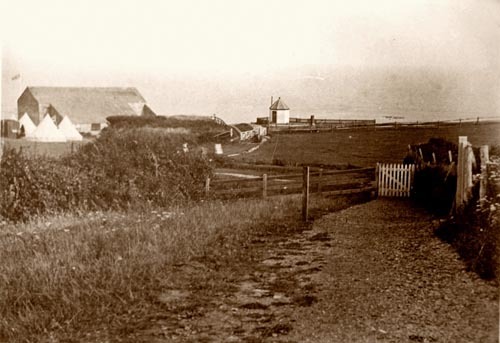 A view c.1911 of The Battery, used by the Coastguards for their ammunition, In the distance is The Sanctuary and Sea Horse House. 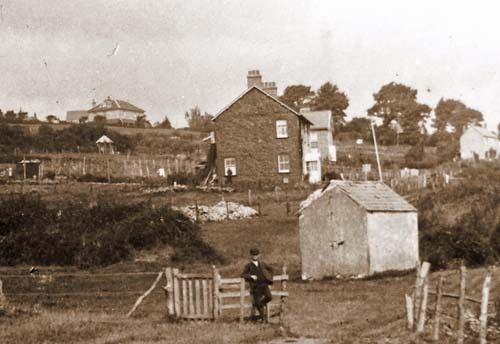 Top end of Higher Sea Lane showing new built Council House in 1922.